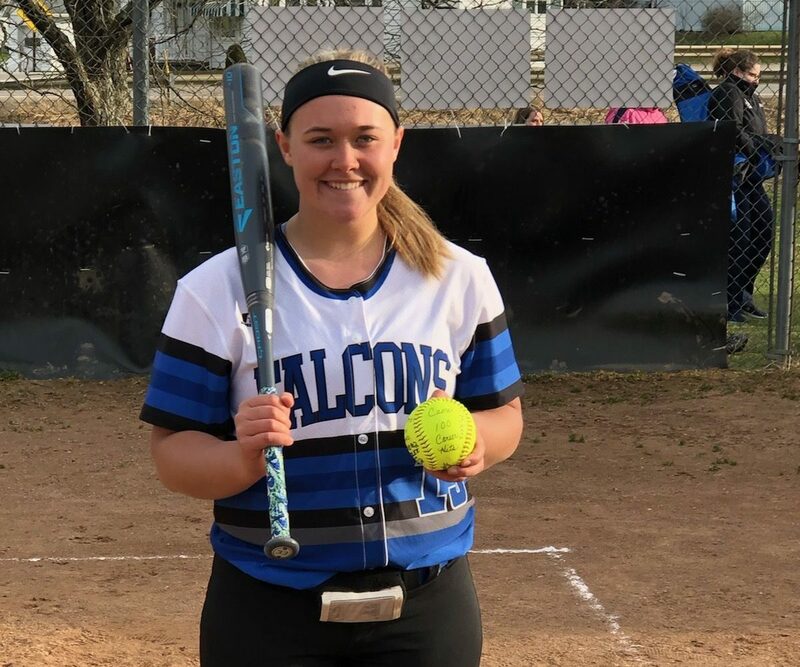 PERRY TOWNSHIP, Pa. – Cami McNany recorder her 100th career hit in A-C Valleys 11-10 victory over visiting Redbank Valley. McNany went 3-for-3 and scored twice while driving in four runs to lead the Lady Falcons. Emily Wetzel doubled and scored three runs. Andrea Meals had a pair of hits including a double and an RBI with Sydnie Schmidt chipping in for two RBIs to go along with a run. Brynn Rearick went 3-for-5 with a pair of runs and five RBIs to pace the Lady Bulldogs. Montana Hetrick, Elaina Miller and Teja Hageter each scored twice. Schmidt started the game in the circle for A-C Valley and gave up five runs and five hits while striking out two in 1 ⅔ innings. Baylee Blauser pitched four innings striking out four and allowing two hits. Hetrick took the loss for Redbank Valley, striking out three and giving up 13 hits. 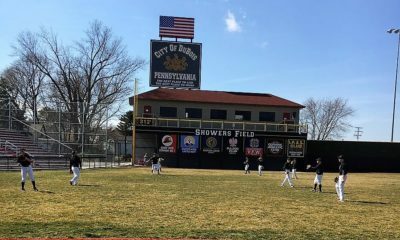 CURWENSVILLE, Pa. – Logan Sheeder went 3-for-3 and scored three times to lead Curwensville to a 15-0, three-inning victory over visiting Kane. Joslynne Freyer went 3-for-3, including a triple, and drove in four runs to lead the Lady Tide. Alyssa Bakaysa and Taylor Luzier each had three hits while Ally Hess singled and drove in two scores. Bailey Bloom tripled and added two scores with Kelsi Bumbarger chipping in for two runs. Emma Ely and Mia Smith each doubled to pace the Lady Wolves. Ella Marconi chipped in for a single. Freyer struck out six and allowed three hit in the win for Curwensville. SENECA, Pa. – Cranberry scored two runs in the bottom of the seventh to rally for a 3-2 win over visiting Clarion. Megan Hadden led the Berries with a pair of hits and a run scored while Rachel McCauley went 3-for-3, including a triple and drove in one score. Andrea Watson singled on her way to a score and Olivia Plummer chipped in for a run. Malliah Schreck chipped in with a triple. Jordan Best and Lindsey Kemmer each scored a run to pace the Lady Cats. Tori Vega doubled and drove in two scores with Ava Kiser and Brenna Campbell each hitting a single. Kait Constantino stuck out eight but allowed seven hits and three runs in the loss for Clarion. Plumber earned the win in the circle for Cranberry, striking out five while allowing three hits and two runs. SHINGLEHOUSE, Pa. – Emily Cross went 3-for-3 with a home run and three RBIs to lift visiting Bucktail over Oswayo Valley, 14-0, in five innings. Jordan Burrows went 2-for-3 and scored three times to lead the Lady Bucks. Emma Poorman doubled and added a pair of scores with three RBIs. Tessa Cowfer drove in a pair of runs and Emma Intallura chipped in for a run. Karley Carpenter, Kaci Chappell and Mackenzie Mesler each singled to pace Oswayo Valley. Karina West took the loss allowing five hits and 11 runs while striking out 10. DUBOIS, Pa. – Ashley Wruble went 2-for-2 with a home run and five RBIs to lead DuBois Central Catholic to a 15-0 three-inning win over Brockway. Shayleigh Gulvas doubled and had a pair of runs for the Lady Cardinals with Avery Sickeri scoring three times. Chelsea Bussato had three RBIs and a pair of hits and Alyssa Bittner chipped in for two runs. Ashley Wruble and Morgan Tyler combined for a no-hitter with eight strikeouts. HYDE, Pa. – Olivia Bender scored four runs to help Clearfield defeat visiting Huntingdon, 11-1. Emma Hipps and Casey English each homered for the Lady Bison while Morgan Cheek went 3-for-4 and drove in three runs. Lauren Ressler doubled and scored twice while Karly Rumsky and Kylee Hertlein each added a run. Hipps struck out 15 and gave up four hits and a run in the win for Clearfield. RIMERSBURG, Pa. – Pitching and a balanced scoring attack earned visiting Karns City a 21-0, three-inning victory at Union. Logan Byers, Garrah Milochik, Alyssa Stitt and Emily Wolfe each homered to lead the Lady Gremlins scoring attack. Stitt and Wolfe each had three hits scoring each time while Mackenzie Dunn went 2-for-2 with a pair of runs and three RBIs. Katie Neff added a pair of runs and Taylor Ekis went 3-for-3 and scored twice. Sierra Salvo doubled and Rylie Colligan singled to pace the Damsels. Karns City pitchers Byers, Makenzie Shay and Allison Walker each pitched an inning and combined for two allowed hits. BROOKVILLE, Pa. — Visiting St. Marys scored in six of seven at-bats and pulled away for a 17-3 win over Brookville at Northside Field. The Lady Dutch led 8-1 after three innings and 11-1 going into the bottom of the fifth before Brookville extended the game with a run to avoid the 10-Run Rule. St. Marys put up six more runs in the seventh, finishing off a 20-hit effort off three Brookville pitchers. Britney Shaw and Mekenzie Gillen each had four hits, Brianna Grotzinger had three hits and Tessa Grotzinger finished with two hits. Maura Fledderman went six innings and struck out eight to get the win in the circle. Carlie McManigle led the Lady Raiders with three hits. Julie MacWilliams and Leah Kammerdiner each had two hits. KNOX, Pa. – Moniteau scored 11 runs in the fifth inning to earn a 21-1, five inning victory over Keystone. Dolcey Shunk led the Lady Warriors with five runs and an RBI while Amanda Dailey went 3-for-3 with a home run with four RBIs. Abby Rottmen doubled and drove in three runs with Cassidy Claypoole adding three runs and two RBIs. Courtney Stewart got the win for Moniteau, striking out two batters while allowing one hit and the lone run. FOXBURG, Pa. – Redbank Valley held off a late charge in the ninth inning to defeat A-C Valley, 4-3. Hunter Buzard homered and drove in Nick Smith to break a 2-2 tie in the ninth inning to give the Bulldogs a 4-2 lead. The Falcons answered with a Joe Dehart run that was driven in off a fielder’s choice to cut the deficit to 4-3, but a pop out fly from Tanner Merwin with the bases loaded ended a chance at a comeback. Buzard drove in two runs for the Bulldogs while Lagan Wadding singled on his way to a score. Byrson Bain chipped in for a run and Jimmy Gundlach drove in a score. Merwin paced the Falcons with a pair of hits while Luke Whitcomb homered and drove in two scores. Bain pitched the first seven innings for Redbank Valley, striking out eight and allowing four hits and two runs. Blaney Brooks finished the game and earned the win allowing four hits while striking out one batter. Merwin allowed three hits and three runs in the final 3 ⅔ innings in the loss for A-C Valley. Broc Weigle struck out eight and gave up one hit in 5 ⅓ innings. JOHNSONBURG, Pa. – Johnsonburg scored three runs in the bottom of the sixth and rallied to beat visiting Smethport, 5-4. Zack Zameroski went 1-for-3 with two runs and a pair of RBIs to lead the Rams. Ethan Wells scored twice and Camron Marciniak singled on his way to a run. Noah Costa paced the Hubbers with a pair of hits and a run. Nate Hollowell singled and drove in two runs while Grant Ognen went 1-for-2 and added a run. Gabe Watts started the game on the mound for Johnsonburg and struck out seven and allowed hits in 3 ⅓ innings. Austin Green finished the game, giving up three hits and a run while striking out four. Hollowell struck out seven but allowed four hits and five runs in the loss for Smethport. ST. MARYS, Pa. – Seth Dunkle combined with starter Dane Lyle to scatter seven hits on the mound while going 3-for-4 at the plate to lead Brookville to an 8-7 win over St. Marys at Berwind Park. The Raiders’ four-run second inning put them up for good, but St. Marys was never far away. Brookville led 5-4 after three innings and 7-6 through four innings before adding a run in the fifth. The Dutch got within 8-7 with a run in the bottom of the sixth. Dunkle went the final 3 ⅔ innings to get the win, giving up one hit and two walks while striking out 1 and walking two. The Dutch’s run off Dunkle in the sixth was unearned. Dane Lyle, making his first pitching appearance of the year, threw the first 3 ⅓ innings, giving up six hits and walking four while striking out three. The Raiders had 13 hits off Dutch pitchers Matt Bellina and Connor Bressler. Jace Miner, Aaron Park, Hunter Roney and Chase Palmer each had two hits. Park doubled and tripled, driving in four runs. Miner doubled. Kael Azzato singled twice for the Dutch. Bellina took the loss, giving up 11 hits and seven runs in 3 ⅓ innings. SENECA, Pa. – Skylar Rhoades scored three runs to help visiting Clarion earn a 10-2 victory over Cranberry. Chase Kriebel went 2-for-4 with a run and two RBIs for the Bobcats. Nate Datko scored twice while Lake Staub and Calvin German each picked up a pair of hits. Trevor Gladin paced the Berries with a pair of hits while Brandon Forrest and Andrew Jordan scored one run apiece. Rhoades picked up the win on the mound with six strikeouts, tossing a five-hitter. Gladin took the loss for Cranberry giving up six hits and six runs while striking out five batters. KANE, Pa. – Noah VonGunden doubled and scored a run to help visiting Curwensville defeat Kane, 2-1. Jake McCracken went 1-for-2 for the Tide with Avery Francisco and Broc Heitsenreather each driving in a score. Cameron Whiteman had a pair of hits to pace the Wolves and Zach Dunn singled on his way to score the lone run. Christian Bakaysa got the win for Curwensville striking out four and allowing five hits. Ty Stahli struck out seven but allowed two hits and two runs in the loss for Kane. DUBOIS, Pa. – Dayne Bauman threw a complete game shutout to help DuBois blank visiting Bradford, 3-0. Bauman gave up four hits and struck out four in seven innings on the mound. The Owls got singles from Tyler Gigliotto, Caleb Nuzzo, Peyton Manion and Austen Davis. Michael Gow pitched the first four innings and struck out two while allowing two hits and a run for Bradford. Gigliotti finished the game giving up four hits and two runs to go along with two strikeouts. DuBois offensive stats were not available. STRATTANVILLE, Pa. – Clarion-Limestone defeated visiting North Clarion, 12-4. Tyler Wolbert went 2-for-2 and added a score to pace the Wolves while Bryce Bower and Devon Walters each had a pair of hits. Korey Mills chipped in for a score. Bauer took the loss for North Clarion giving up six runs and four hits. C-L stats were not available. BROCKWAY, Pa. – Brandon Walker went 2-for-4 with three runs and an RBI to help visiting DuBois Central Catholic defeat Brockway, 9-3. Brandon Walker had three runs and an RBI to lead the Cardinals scoring attack. Damon Foster went 3-for-4 with a pair of runs while Justin Miknis had a pair of hits and two RBIs. Peter Downer doubled and scored twice while Noah Bloom doubled and drove in three scores. Santino Inzana went 2-for-2 with a run to pace the Rovers. Benjamin Glasl scored once and drove in two runs with Zane Puhala adding a run. Anthony Kness gave up three hits and three runs while striking out four in the win for DCC. Nickelas Porrin took the loss for Brockway allowing six hits and four runs in one inning on the mound. Tyler Serafini and Inzana pitched the rest of the game combining for five strikeouts and nine allowed hits. 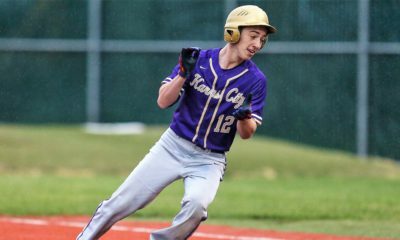 RIMERSBURG, Pa. – Karns City used a balanced scoring attack to defeat Union, 11-1 in five innings. Steve O’donnell led the Gremlin offense going 2-for-3 including a double and scored twice. Cameron Blair added a score and drove in two runs while Jake Weckerly and Tyler Yough each chipped in for a pair of runs. The Knights managed two hits on the day coming from Karter Vogle and Luke Salvo. Carter Terwint scored the lone run. O’Donnell struck out five while allowing two hits and a run in the win for Karns City. Reice Saylor pitched 3 ⅓ innings for Union, striking out six while allowing five hits and eight runs in the loss. 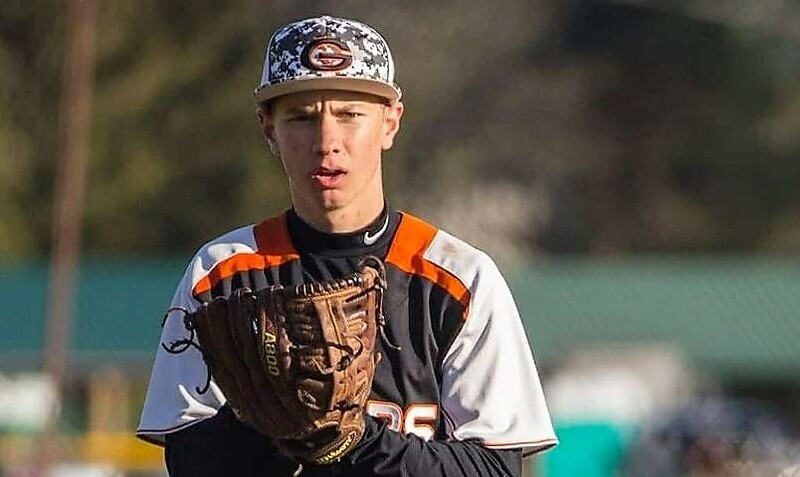 KNOX, Pa. – Hunter Fitzingo went 2-for-3 with two runs and an RBI to help visiting Moniteau defeat Keystone, 11-0 in five innings. Tyler McFadden had a pair hits and drove in four scores to lead the Warriors. Gage Neal and Chance Nagy each scored twice while Jared Lominski tripled on his way to a score and added two RBIs. JD Dessicino doubled with a pair of RBIs and Tanner Williams added a run. Troy Johnson had the lone hit for the Panthers. Lee DeMatteis pitched three innings on the mound striking out three and walking two to get the victory for Moniteau. Andrew Lauer took the loss for Keystone allowing eight runs and three hits while striking out five and walking eight.